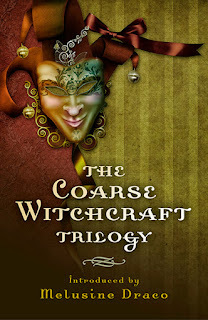 The stories related in the Coarse Witchcraft series of books have happened to experienced practitioners who are confident enough in their own magical abilities to be able to say ‘I made a mistake’. We all make those mistakes – the fun lies in sharing them. And as the late Bob Clay-Egerton once remarked, he’d got 50 years' magical experience under his belt and he still occasionally made a prat of himself! Arm-chair witchery has a lot to answer for and it’s time for folk to sling out the books which expound the dubious advantages of the popular pick-n-mix approach to magic before someone gets hurt. Those new to Craft have a great deal of difficulty in understanding that cross-Tradition working can produce some extremely unpleasant or unexpected results – details of which don’t feature in the popular pagan press. Like the witch-mum who, after packing the kids off to bed, settled herself down for a spot of gentle meditation by candle light, whilst taking a bath. One of the candles tipped over into the water and as our dedicated witch leaped up and bent over to retrieve it, she scorched her pudenda on another candle which gave a whole new meaning to the term Red Hot Mama. Like the chap who invoked Isis is an area sacred to Brighde and wondered why the Celtic deity reacted strongly to the invasion of this foreign bint. Conflicting energies can cause sickness and disorientation because of the disruption of balance, so it is unwise to try to work with differing focuses of power in the same ritual. Like the chap who claimed to an Old Craft Elder’s face that he was from her own teaching tradition (he’d never worked with her or her coven) because he’d read something of hers in a magazine. The look on his face when someone explained to whom he was speaking was a sight to behold. to know she was a pagan. Like the budding ritual magicians who invoked power into the triangle of conjuration placed inside the protective magic circle with themselves. deities and leave the Dark Ones for the darker nights and shadow working. Neither is it a good idea to schedule a ‘lovespell’ for All Hallows (Samhain), unless you’re into necrophilia. Now whatever you read about witchcraft these days there is always the profusion of names to cope with and in modern Wicca, the Goddess is a rose by any other name, regardless of whether it’s Celtic, Norse, Roman, Egyptian, Anglo-Saxon or Greek. In Old Craft the deities are, more often than not, referred to simply as the Lass and the Ol’ Lad. Newcomers are confused by this seemingly irreverent appellation but Old Crafters don’t need all the extravagant trappings, ritual equipment and symbolism. To paraphrase from one of Alan Richardson’s books: all the images of gods and goddesses are products of our own making, which we use to give our minds something to focus on. The Lass and the Ol’ Lad are good enough for us. All this information is readily available in book form to anyone but what is never pointed out is that in all realms of magic there are the Lesser and Greater Mysteries. The former are basic instructions for approaching a magical path but no matter how well read a person, they will never find any ‘secret truths’ in books. Even those written by well-known names in Craft will always stop short of revelation no matter what the publisher’s blurb may promise. Those ‘names’ are fully aware that by revealing more than just the Lesser Mysteries would be breaking their oaths, not just to the Craft but to their fellow Initiates. The Greater Mysteries themselves can only be understood by practical experience; they cannot be taught or expressed in words. It is often difficult for the beginner to accept that there is no secret formula which will help them avoid the hard work involved. It is also difficult for many to understand that formal initiation into one particular group or Tradition merely means the initiate has been accepted by that group or Tradition – not Craft per se. Neither does it automatically follow that the Greater Mysteries have been revealed to that Initiate. Books and teachers can only map out a few basic signposts; all they ever will be is the finger pointing the way in the Silence that follows. is’. The problem with most of the letter writers is that they’ve learned their witchcraft from books and when they get conflicting information from different authors, they don’t have the practical experience to differentiate between modern Wicca and traditional Old Craft. Admittedly there have been one or two who have benefited from a guiding hand but, by and large, the content of the letters hardly stimulate the intellect – or the sympathy for that matter. We were sitting at the kitchen table sorting through some of the letters and becoming increasingly despondent at the number from people who obviously just wanted someone to write to. The agony was in the repetitive saga of manifested ‘things’ that were lurking around in hundreds of bedrooms up and down the country. 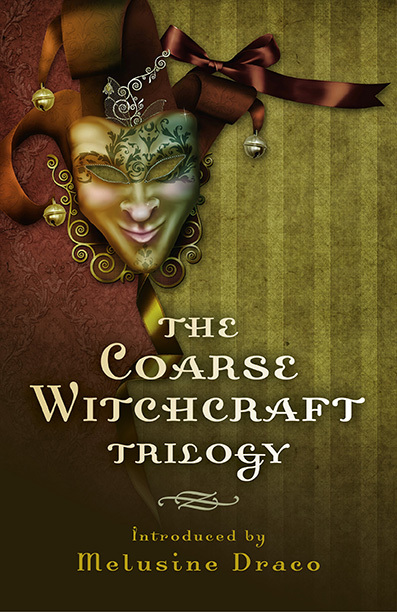 You can view The Coarse Witchcraft Trilogy on Amazon. The series is written by Rupert Percy and Gabrielle Sidonie, with an introduction by Melusine Draco, and is published by Moon Books. Thank you , love this. I think this book might be a breath of fresh air. Thanks for sharing it.